Process flow sequence and operating procedures should be thoroughly understood so that equipment arrangement in the plot plan is functional. Equipment should be arranged in logistic process sequence for optimum piping runs and operational and maintenance ease. Spacing between equipment shall be adequate for undertaking maintenance jobs. The unit pipe rack should be kept in the centre, thereby splitting the unit into two or more areas of equipment. Pumps may be arranged in two rows close to and on either side of the pipe rack. Heat Exchangers and vessels should be grouped together forming outer rows on both sides of the rack. Platforms, ladders and stairways shall be in the minimum consistent with access and safety requirements. Access to platforms shall be by permanent side step ladder. The need for stairways shall be determined based on platform elevation, number of points requiring attention, observation and adjustments and the frequency of same. When there is more than 23000 mm of travel from the primary access on a platform, a secondary means of escape shall be provided. Safety cages not required for ladders serving platform 2500 mm or less above the high point of finished surface. Safety cage not required for ladders serving platforms 2500 mm or less above originating platform provided the space between the ladder and the edge of the platform is a minimum of 1200 mm. Safety cages are not required for short ladders. Maximum uninterrupted ladder length distance between vertical platforms shall not exceed 9000 mm. Maximum rise on a staircase shall not exceed 20 steps. The preferred distance of a platform below the centerline of a manway shall be 750 mm, max 1000mm and min 600 mm. Equipment should be spaced to permit use of mobile equipment and power tools or servicing and maintaining equipment during turn around periods. 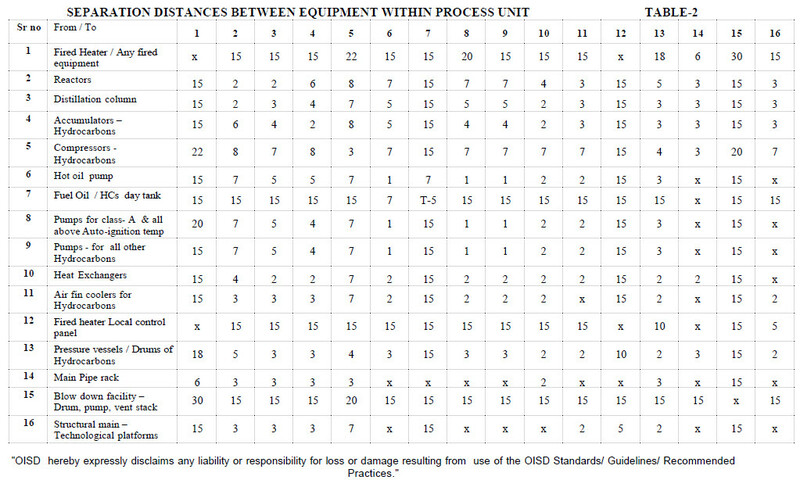 OISD 118 Table-2 Should be followed for Indian Projects.